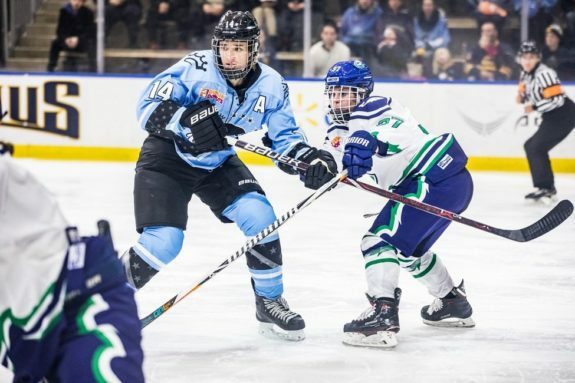 Less than 24 hours after they announced a major coaching change, the Buffalo Beauts came out with a 3-1 victory over the visiting Connecticut Whale. Word was released by the organization shortly after eight o’clock in the evening on Dec. 8, 2018 that head coach Ric Seiling and assistant coach Craig Muni were relieved of their duties. When the Beauts faced the Whale at six o’clock the following evening, General Manager Nik Fattey – now newly named as interim assistant coach – assumed the duties behind the bench. Newly named interim head coach – and former Buffalo Sabres forward – Cody McCormick was not present for the game due to a prior engagement with the indigenous community. GM, Nik Fattey met the media to discuss yesterday’s news. From outward appearances alone, the quick, unexpected change did not seem to phase the Beauts players themselves. While Connecticut certainly held their own and made things challenging for the home team, Buffalo responded with three solid periods of play. Steadfast would be the best word to describe their play. There was a sense of wanting to continue on regardless of what had transpired on the upper end of things. In some ways, such a response is surprising. While the Beauts players already have a working relationship with Fattey (and also one with McCormick too) a coaching change is a coaching change, and player response can go any number of ways. In this instance though, the Beauts kept it business as usual and got the job done. Fattey met with the media before the game got underway to accept questions about the sudden movement. Questions were indeed answer, although how quickly the transition came about still left at least some feelings of perplexity. That may not have been possible to avoid no matter how Fattey replied. Buffalo’s Hayley Scamurra battles with Connecticut’s Colleen Murphy on Dec. 8, 2018 (Photo Credit: Pat McCarthy). Prior to the 3-1 win, the Beauts possessed a record of 3-3. For a team that had signed four Olympians from the PyeongChang Winter Games, the reigning NWHL Rookie of the Year (Hayley Scamurra), and a total of eight players from the 2017 Isobel Cup-winning squad, a .500 record was not acceptable. At least not to Fattey. Though in the defense of his decision, most NWHL experts and novices assumed that Buffalo would steamroll the league. That has not happened. The Beauts scored a goal in all three periods during the 3-1 win over Connecticut. 35 shots were sent the way of Whale goalie Meeri Räisänen, who was brilliant in net despite the loss. Since it was Buffalo’s “Teddy Bear Toss Game”, rookie Juls Iafallo got the HarborCenter to rain down bears of all shapes and sizes when she put one into a wide open net late in the first, after Räisänen had already committed to three prior stops. Kelly Babstock and Dani Cameranesi received the assists on the goal. One of the most upbeat players in the entire league is Babstock, and she was quintessential in ensuring the Beauts met change with victory. Assisting on Iafallo’s goal was the first of a pair of helpers that the hard-nosed forward had during the game. Babstock’s two assists led the Beauts in scoring on the evening. Her four penalty minutes also led the team, and were consistent with her usual rugged style. 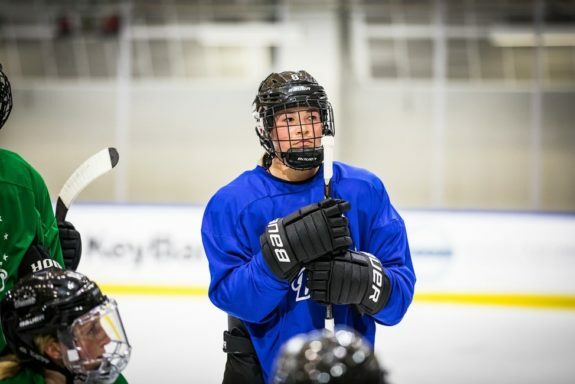 Buffalo’s Kelly Babstock is an original NWHLer, and has been a natural leader for her hockey club after coming over from three seasons with the Whale (Photo Credit: Pat McCarthy). Babstock’s other assist was the secondary one on Scamurra’s game-winner. The 26-year old has been in the NWHL since the league’s first season, but this is her first with the Beauts. Babstock’s three prior seasons were all as a member of the Whale. Having been around since the beginning, she has witnessed change and sets a strong example of how it should be dealt with. Buffalo has nine games remaining in the regular season. Six of those games are on home ice, including the Dec. 29 showdown against the Minnesota Whitecaps across the street in the Sabres’ home rink, the KeyBank Center. In order to guarantee home ice advantage throughout the postseason, Buffalo will need to rise up the standings and not afford themselves any further losses. The more important thing to remember is that when they face the Whitecaps at KeyBank – which is also their next regular season game – the dust will have settled from the coaching changes. McCormick will have taken the reigns on the bench, with Fattey assisting at least for the interim. A better sense of how this team will finish out the season should be more apparent.